This is almost worrisome. I started painting for this WW1 toy soldier thing in mid-July and so far there is no sign of flagging production or of wandering attention, if anything my enthusiasm is increasing. Well, get it while it's going. A month or so ago I promised a comparison photo. L to R, Glorious Little Soldiers from Big Andy C., Scruby, STS (via Jacklex), Zinnbrigade, Irregular, Zinnbrigade. 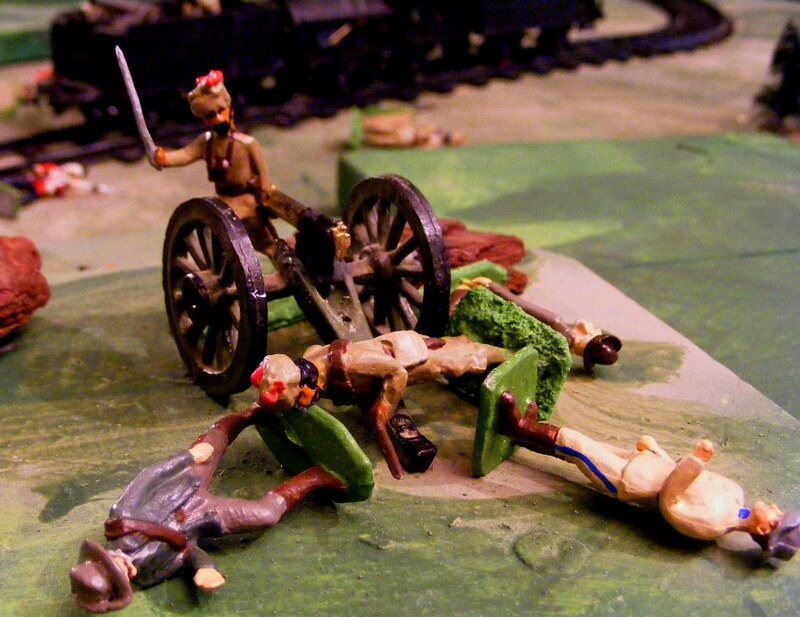 Note that the 1st Zinnbrigade figure is running and is leaning forward rather than short. The 1st figure is similar in height to the one Britain's W range infantryman that I have. The others are closer to Elastolin in size. Even more unusual for me is that, after an initial flurry, I've been dragging my feet on rules exploration and test games. I have a pretty good idea of the overall look and feel that I want for both armies and games but within that framework have 3 different combat mechanisms under consideration. Rather than testing them with stand-in armies as is my wont, I have decided to wait until I have sufficient appropriate figures for France in the fall of 1914. In preparation, the trial 6" squares have been reverted to 4" ones. I liked the look of the bigger squares but my 4 man units looked lost and I decided that more squares would mean more tactical and scenario options. Since the 4" squares had worked in early games as well as in earlier periods, they seemed like the best all around choice. Case closed. Zinnbrigade lancer and STS cavalryman. How far is it to Tipperary again? The first batch of Tommies are done. I apologize if they are hard to make out against the earthy backdrop, I was just trying to get some light. It is an interesting comment on choice of colour though. Since these were cast to be the other half of the German shooting battalion I now need to cast up 16 more figures so I can finish both units, and some more command figures and gunners, oh and cavalry for the BEF. Looks like a good day for it. Meanwhile, in and around domestic duties associated with the passage from summer to autumn, research and experimentation continues. Here we see the results of cupboard archaeology with Frankensteinian Technological Research. In the back ground can be seen Dollar Store rip offs of Marx barbed wire and sandbag entrenchments. There is an estimated 10 feet of wire. The total number of emplacements has not been studied yet but both are acceptable to me for use with my 40's. I really should paint the barbed wire a less shiny silver, less plasticy colour but it feels like a lot of work for little reward so we'll see. In the forground are some heavy artillery cannibalized from more dollar store parts with some homecast bits. Neither are finished. The Stanfield Armament Co. "Long John" (Canadian insider ref for those of a certain age) is a Marx ripoff barrel on PA carriage which needs some work yet. The barrell is a bit thin but it'll work I think. Last but not least, my increasing engagement with sideshows has decided me to just convert enough 1914 Tommies for a few scenarios and save resources for some guys in shirts and sunhelmets. These are Zinnbrigade Prussians with the helmet cut short leaving the peak, boots cut to puttees and extra ammo pouches added. The haversack and canteen are on the wrong hip but I will probably leave them. Facing are the latest 8 recruits for the Kaiser. Along the research lines, I downloaded Von Lettow Vorbeck's memoir of his East African campaigns for a dollar from Amazon. An even more compelling idea came from a less likely place. I downloaded, for free, a copy of the official history of the Canadian Corps which has a section on other deployments, mostly engineering stuff but in 1918 a small group of officers and ncos joined Dunsterforce in the Caucasus, acting as advisors for local forces against various enemies including tribesmen with German advisors, Turks and Kurds. Regulars from various coubtries, tribesmen, levies, cossacks, circassians, kurds, armoured cars, planes, RN ships on the Caspian, mountains, ideal blend of WW1 and Colonial. It was the mention of a rearguard to protect retreating Assyrians that clinched it! Assyrians? Anyway, very topical and something I intend to find out more about. Our correspondent in the Kapelle District has filed this report on the opening of hostilities on the Oerburg frontier. Company Commander Kitchi leading the charge which captured the enemy PomPom gun. No one seeing the return of that bullet scarred train could doubt the serious nature of this dastardly attack. Ever since Uncle Bob challenged Her Majesty's rights to the gold fields in the lower Kapelle foothills, a weekly patrol train has made the run through New Station to Rahdun. This week the train carried 2 companies of Royal Fusiliers, 2 companies and a Maxim gun of Ross's Rifles, a native Atlantican battalion recently raised from the Kapelle region and a section of the newly raised Koolahat Mountain Battery. Ambush! The troops detrain and return fire. Eye witnesses of yesterday's incident report that upon approaching New Station, there appeared to be a tree fallen across the track. As the train slowed to allow the soldiers to clear the way, the surrounding hills erupted in rifle fire and the pom pom pom of a 1 pounder Maxim. It appears that Old Cords has been preparing for this day by importing modern weapons while dragging out talks. The quick firing gun appeared to be supported by 3 squadrons of mounted riflemen hiding in cover on three sides of the train. The infantry is hit hard by flanking fire from a hill until the maxim comes into action and drives off the enemy riflemen. As the mountain battery returned fire, the troops began to detrain only to be cut down by accurate rifle fire from the surrounding hills. It wasn't until the Maxim came into action and drove the Oerberg riflemen from the southern hill that the troops could bring the fight to the enemy. On the North side, Company Commander Kitchi led his men in a bayonet charge against the troublesome pompom. Despite its furious fire his men followed him up the hill and into the enemy position. The gun was crewed partly by Oerberg Constabulary and they defended it manfully. It was a mere rump of a company that remained when the last enemy soldier was accounted for. 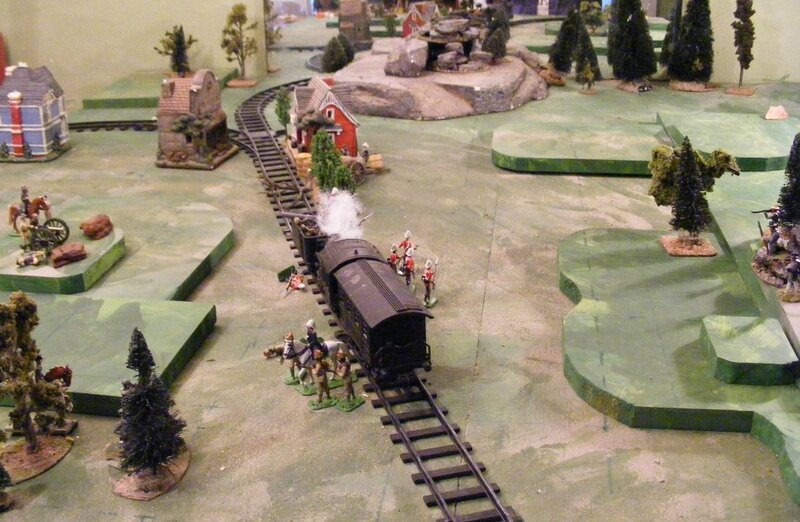 The Redcoats storm the station but are driven back by accurate rifle fire. The main Oerberg position was behind a barricade covering the roadblock. While the Rifles drew off the fire of the Pompom, the Royals assaulted the enemy barricades despite having already taken heavy casualties. The first company was cut to pieces by riflefire and forced to retreat but the second managed to break into the enemy position briefly before being forced back by weight of numbers. The patrol had taken heavy losses and enemy horsemen could be seen galloping in to reinforce the key positions. Reluctantly Colonel Martin decided that his duty now lay in saving as many men as possible while reporting the treacherous attack. Loading as many wounded as possible the patrol falls back to report. 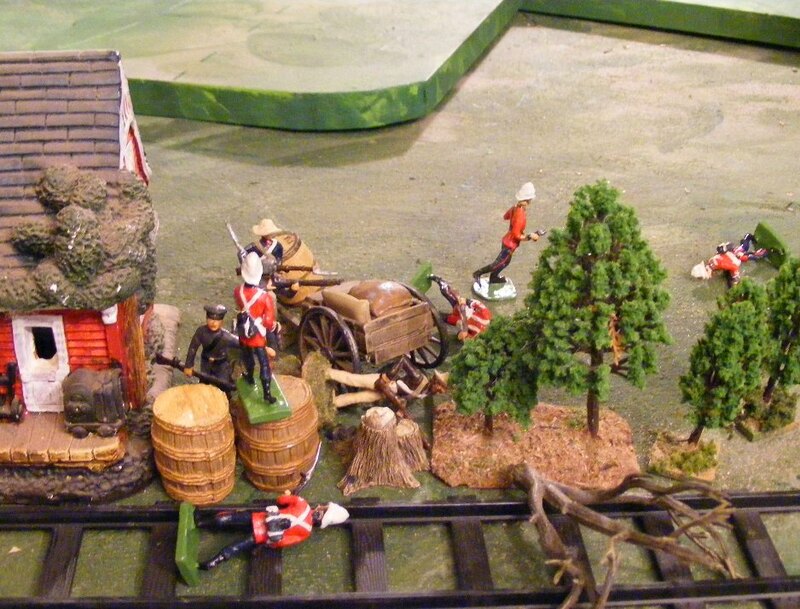 It had been a bloody hour but the newly raised local regiments had proved themselves in battle, there is even talk of a medal for CC Kitchi and there is no doubt that retribution will come. More details to follow in the days ahead. 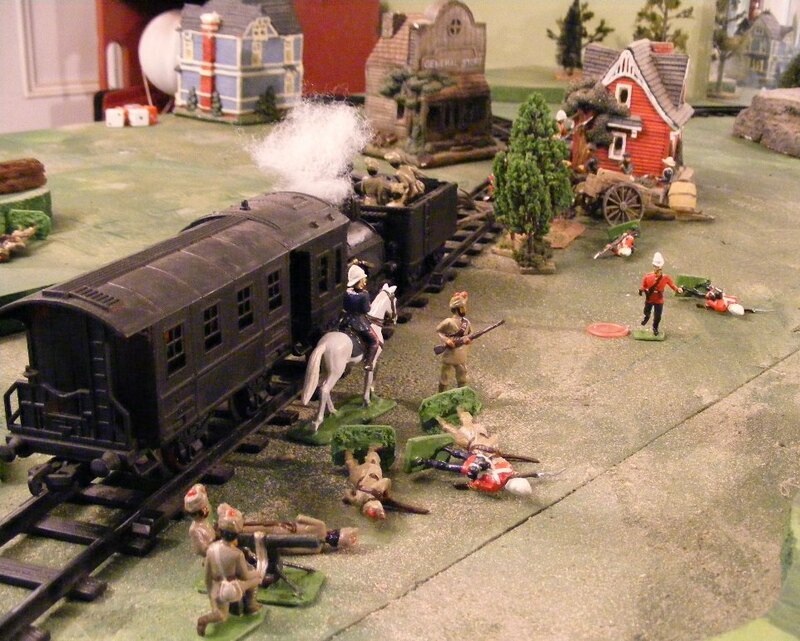 Artist conception of Oerberg troops ambushing a Faraway train on patrol. 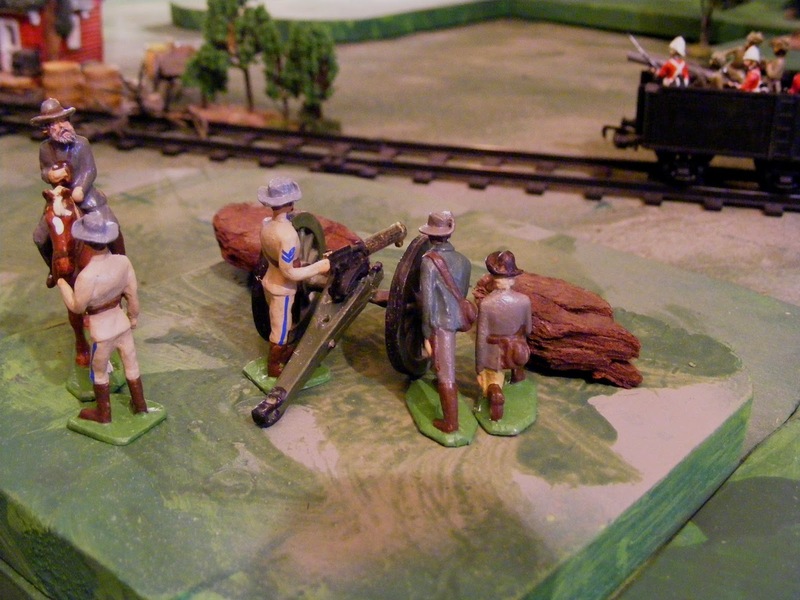 Today Oerberg's President, more commonly referred to as 'Uncle Bob' or 'Old Cords' declared an end to boundary discussions with Her Majesty by opening fire on a patrol operating on a section of railroad near New Junction in Faraway's Northwest Territory, above the central mountains. It seems that Old Cords, so called from his oft quoted saying that "brains not clothes, make the man" and his habit of governing in his everyday corderoy work clothes, has decided that Oerberg's bogus claims to the gold fields in the Kapelle hills may be only be won by a show of strength and that the long peace is an indication that Faraway will not fight.. Details of the incident will follow but a spokesman for Her Majesty has promised that this challenge to our rights in this area will not go unanswered but that at this time there was no need to mobilize as local security forces are confident of settling with this ragtag bunch of farmers. While I was trying to decide on a scenario for my upcoming game, I kept running into scenarios I wanted to play with 1914 troops. If I play them all now with earlier armies in bright uniforms, will I want to play them again with drab ones? So I looked at my other options and decided that since I want to get the new Indian units into action, I would try a Colonial game......... with a train. So back to Atlantica, c 1902. This make shift pom pom gun ought to be ready by noon on Sunday. A proper gun will follow. I also decided that it was time to try that Charge! inspired version of the rules but with a twist. To keep the game looking right, not over crowded, I would reduce the player's force to a brigade and use the 4 man company as the basic unit and battalions as the intermediate command level. Boer pom pom gun from the Wiki article. The forces will be a bit of a mishmash but with careful selection and a few new figures I can start dabbling in my not quite Northwest Rebellion/Boer War. The Black Fox would be too old to leave the Rebels by then but the son of his elder years, known as Kit or The young Fox, would be about the right age. Beautiful sunny fall weather here, good for yardwork and good for sleeping at night but not as good as rain for the well or for working on miniatures but the Maxim gun is done. but love it when it disguises faults. I couldn't stand the bent legs on the gun so pulled them out and redid them and shortened the breech a little. A water can seemed a bit too fiddly for a toy and I just didn't have the enthusiasm to try and make a proper structure in between gun and tripod, especially keeping in mind the need for rugged durability and my lack of eye for detail, especially on mechanical things. The crew are all Zinnbrigade homecast Prussian artillery figures with a headswap and boots marked with a knife to suggest puttees. The gunner began life as a seated limber rider. I modified him using techniques learned from Peter Blum's Model Soldier Manual in the early 70's, back before I turned from model soldiers to wargaming. For bends, cut a wedge on the side that will be bent forward and a slit on the other side so that the body, knee etc pivots in the middle when you bend it, on where the joint would be a in a real person. On a 40mm figure, cast in hard pewter, cutting a wedge in the knee proved beyond me so a slit had to serve and as a result I broke the right one causing me no end of grief getting it to stay glued afterwards, hence the base. The figure's arms were cast against his legs so there was no option but to hack them off, drill a hole for a wire inset, bent to the right angle, with putty arms added. I trimmed the wire to what looked like the right length and partway through adding putty, pulled the putty back and trimmed them again. It was only while priming the figures that I realized that with the elbow added, the forearms were still too long. At that point, the only options were to live with it or rip the arms off and start again. 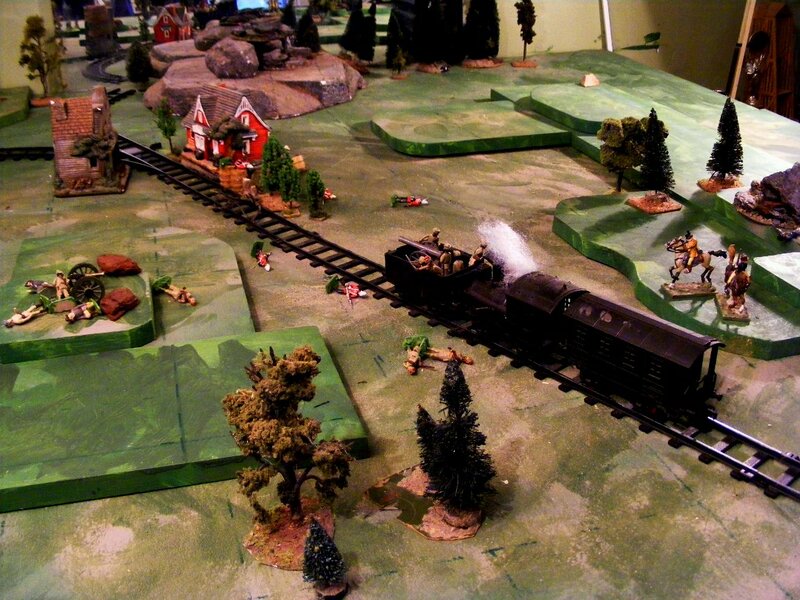 Luckily its less noticeable on a dimly lit wargame table at arms length and surrounded by scenery and other figures. Next up, some dismounted German cavalry made from Zinnbrigade Prussian infantry with equipment ground off, back ammo pouch added and headgear converted to lancer cap or busby. For now I am just doing one dismounted figure per squadron as a marker but I am getting good mileage from these Zinnbrigade molds..
Hopefully Sunday will be a rainy day, suitable for testing my latest rules, scenario conversion and orbat thoughts in a game. As one can see the France 1914 theme is still going strong. The BEF not so much. At this rate I may have to settle for 1st Ypres. I was happier with the Maxim before I cut it free and realized that the legs had been drilled in at too shallow an angle, more appropriate for a prone gunner rather than the sitting one I have been working on. Attempts to subtly bend the legs right where they join the central hub were defeated by the rigidity of the stray bit of wire I used and so I have an awkward bend in the middle. Oh well, it'll work and I've learned a few lessons so that the next will be better. This will probably be the last sitting gunner though. Too dammed much work and he looks like he will be fragile, esp since I snapped his leg trying to spread it. This hard pewter mix is not like the old soft lead/tin. I still have a few bits to do, arms for the gunner, ammo box and belt, modified tunics etc. At least the maxim is slightly simplified vs the Vickers. I haven't quite figured out how to do the sledge for the German gun but I have a few vague ideas. More nice simple infantry first, straight out of the mold to the painting table to give me a break. For we have got the Maxim and They . .what? we don't? But you're working on one? Great, I'll ask the enemy to wait. You're working on one for them too?!?? We're going to need new doggerel. If when I'm finished, I have something easily recognized as a toy MG, I'll be happy. I didn't intend to do any Indian troops this early although they were in France by October. Not that I have anything against them, its only that for more than 40 years I've been putting off doing WWI in Africa and the Middle East and I was afraid they might distract me from my goal of a centennial Retreat from Mons game. However, I hadn't added even a single 1914 British soldier yet and the only suitable mold on hand was my Sepoy. As usual it was Don Featherstone in his Battles With Model Soldiers who first showed me the attraction of wargames set in the so called Sideshows to WWI. What probably sealed the deal shortly afterward was picking up the Ballantine book Tanganyikan Guerrilla one Saturday on my way home from cadets. T.E. Lawrence didn't help and the only WWI project I ever did was a 15mm Arab ambush of a train, complete with tiny Lawrence. Yesterday, instead of painting, sculpting or converting, I spent time online, especially at Harry's Africa and Harry's Sideshows reading accounts of obscure but interesting battles and skirmishes from the early 20thC, well laced with first hand accounts. I also read up on the mountain batteries that served overseas, none of them in France. Some were only in East Africa, others served at various combinations of Gallipoli, Egypt, Mesopotamia and Persia with most being home in time for the 3rd Afghan War in 1919. The 21st Kohat Battery even earned the Title Royal. I couldn't find any mention of the Koolhat Battery. But I am going to persevere with my game in France and then, then I will let my mind and spirit wander over deserts, cross veldt and river, climb mountains and penetrate jungles. PS. My sidebar seems to have disappeared. Anyone else having a problem like this? Can anyone still see it? An Indian Mountain Battery ready to take the field in Africa, the Middle East or wherever they are needed.. These are homecast Zinnbrigade Prussian artillery men with my sepoy heads. The mule is from. Irregular. I'm pretty sure no gunners in 1914 wore Blue puttees but I like 'em. Now I need a name. I dislike using historical unit names if I'm going to use them in campaigns that they never fought in. The gun is a 90 year old toy that came with a mixed bag of 54's from the original owner's widow a decade ago. Its a little crude in places yet the carriage has the typical lines of rivets. I'm not sure about its make or what it was intended to be. It was certainly too small for the 54's. 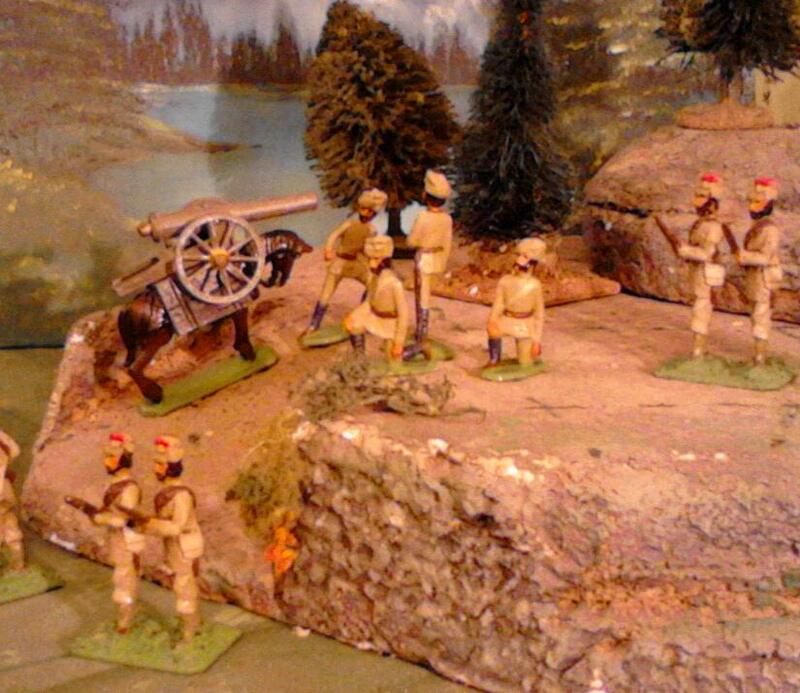 Last week I noticed a 40mm gunner standing beside it and thought "40mm toy soldier mountain gun"! The grey paint is in rough shape but I am undecided about repainting a 90 year old veteran even if it has no monetary value.